Lay lamb flesh-side-up on a chopping board. Spread over the herbs and season with salt and freshly ground black pepper. Drizzle over the olive oil. 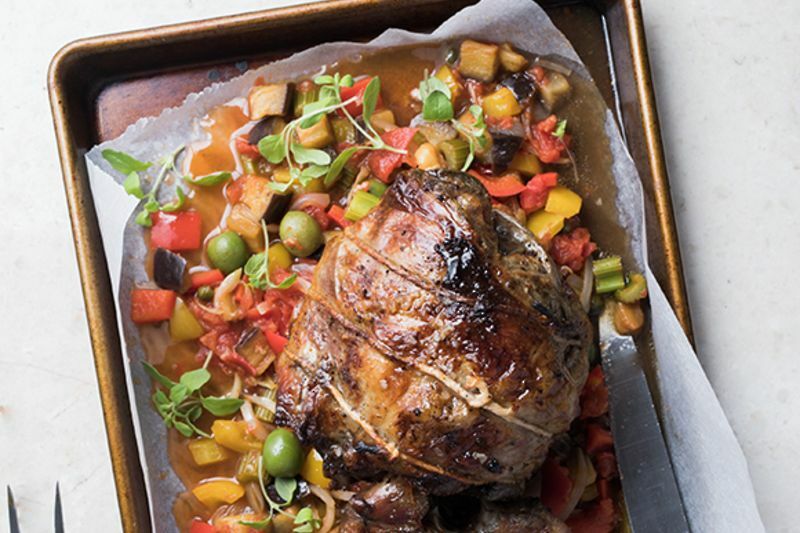 Place the lamb, skin-side-up in a non-metallic oven dish and pour over the wine or vinegar. Pour 1/2 cup water around the lamb. Cover dish with its lid or make a baking paper and foil lid. Place in the oven and cook the lamb for 2 1/2 - 3 hours, or until the meat is very tender. Remove lamb from the oven (see tips). Pour the juices into a heatproof jug and remove all the fat once it has settled to the top. Pour the oil into a wide heavy-based saucepan and place over medium heat. Add the eggplant and cook until soft and golden, then add the onion and cook for a further 5 minutes. Add the garlic, celery and capsicum and cook for 5 minutes. Pour in the red wine vinegar and allow to bubble up. Add a pinch of sugar and the tomatoes. Cook for a further 5 minutes before stirring in the olives, capers and parsley. Season with salt and freshly ground black pepper. Slice the lamb and place on a warmed platter with the vegetables. Drizzle over hot meat juices. Finish dish with extra sprigs of oregano or sweet marjoram. Preheat the oven to 220°C conventional bake. Place all the ingredients, except the oil in a food processor and mix for 30 seconds. Drizzle in the oil until it forms a paste. Season and set aside. Open out the lamb and place with the flesh side up, . Spread over the green herb paste. Starting from one narrow end, roll up neatly into the best shape you can and tie at intervals with kitchen string to secure. Place lamb in a roasting dish and place in preheated oven. Roast for 20 minutes, then reduce the oven temperature to 190°C and roast for a further 40 minutes together with the shallots and potatoes. Transfer lamb and roasted vegetables to a warm plate, cover loosely with foil and keep in a warm place while you make the gravy. While the lamb is roasting, prepare beetroots. Put the vinegar and maple syrup in a bowl and whisk in the oil. Season with salt and freshly ground black pepper. Set aside. Boil beetroot in lightly salted water for about 35 minutes or until just tender when tested with a skewer. Peel beetroot either by using a small sharp knife, or by using your fingers to rub off the skins under slowly running cold water. Cut beetroots in half and place into the dressing and toss. Set aside. .
To serve: Slice lamb and place down the centre of a large platter. 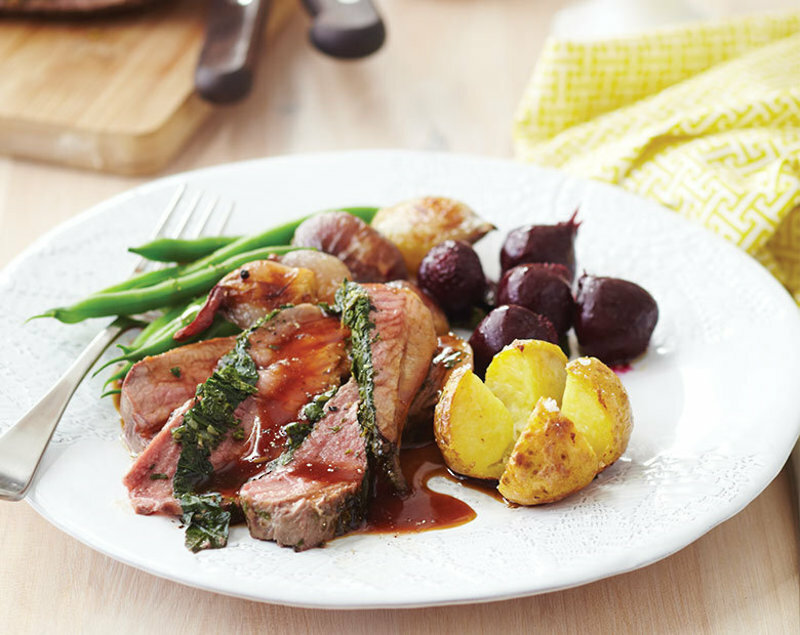 Surround lamb with roasted shallots and potatoes on one side and beetroot and steamed green beans on the other. Serve with a jug of gravy. Cooking lamb is a favourite with many Kiwi families at Christmas time. 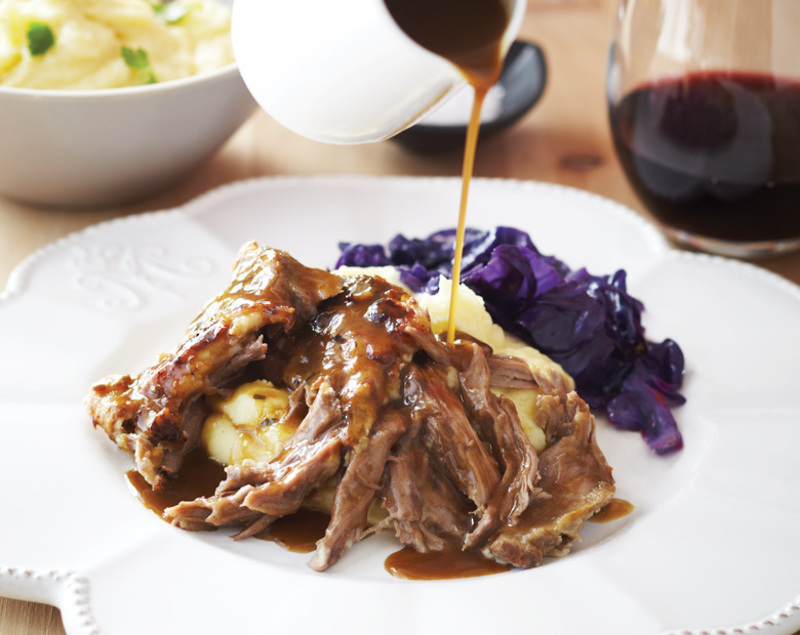 This recipe has been tried and tested and believe us, it\'s perfect for the festive season. 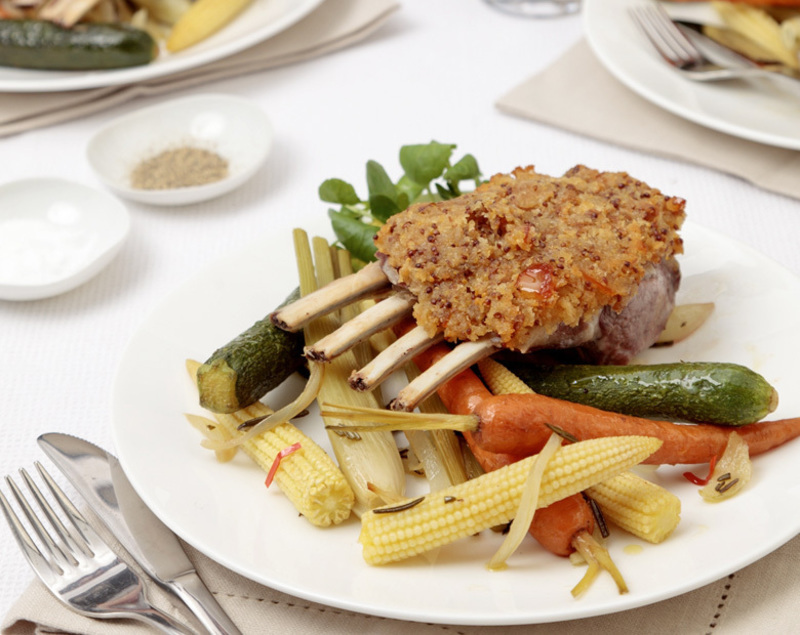 The lamb is meltingly tender and the herb stuffing adds bursts of flavour not to mention beautiful colour to the dish. But the best part? It\'s quick, which means more time to spend with family and friends. Peel the fat cap off the racks and lightly season the lamb racks all over and bring to room temperature on a plate, covered with clingfilm. Cover the dish tightly with tinfoil and bake in the oven for 5 hours or until falling apart. Baste the lamb a couple of times whilst cooking. Remove the tinfoil, turn up the oven to 200°C and cook for another 10-15 minutes until the lamb is browned and crunchy on top. The shoulder has an incredible flavour, and cooking it on a low heat for a long time gives you beautifully tender meat that falls off the bone. Smothered in a rich gravy from the cooking juices, you’ll be in heaven with this meal. And the best part is it’s dead simple to make. A classic with a Kiwi twist. 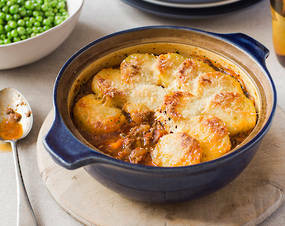 The addition of kumara makes a change from the well-known potato topping - and we love the taste of lamb and kumara together. We bet the little ones in your family will love this meal just as much as you. The lamb can easily be substituted for beef. Place the lamb shanks and herbs in a large saucepan. Pour in the vegetable stock, bring up to the boil then skim away any fat that is rising to the surface. Lower the heat and simmer, covered for 1 hour. Skim away any further fat, then add the onion and pearl barley and continue simmering, covered for a further 1 hour. Add the carrot, leek, turnip, swede and celery to the broth then taste and season. Continue to simmer for a further 30 minutes or until the vegetables are all just tender. Remove the lamb shanks from the pan and place on a board. Pull away the meat and cut into smaller pieces (pieces that will sit easily on a soup spoon). Remove the herbs and discard. Return the lamb to the pan, bring back up to the boil and finally check seasoning. 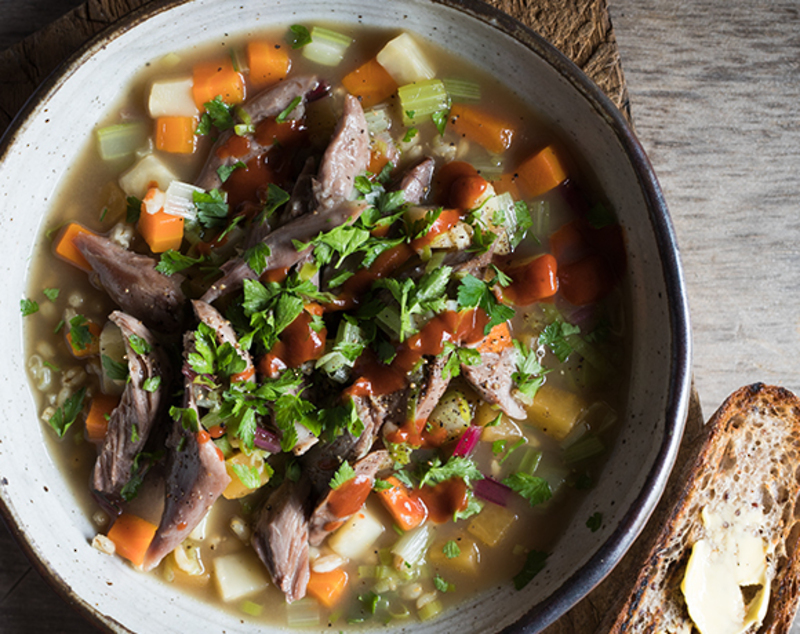 Serve lamb broth in 4 warmed soup bowls and sprinkle with chopped parsley. Drizzle with Sriracha sauce for a bit of heat. Who can resist a vegetable packed broth with tender lamb. The perfect way to warm up on a cold winter day. We like to make extra and leave in the freezer for a healthy go-to meal when time poor.